Our Lift-Top Interchangeable Magnet Window Counter Mats are a durable commercial-grade counter top display with a proven track record of durability in retail stores, restaurants, hotels, and other service industries. They feature a lift-up top and making it easy to place one large insert or multiple smaller inserts. The top is permanently bonded along one edge and the other three edges have a magnet strip flush with the entire edge and around the corners which strengthens and protects them. Available in 3 size options: The 10.5" x 13" mat is designed to hold an 8.5" x 11" insert. The 13" x 19" mat has an 11" x 17" window for one large insert or two 8.5" x 11" inserts side by side. Our new 7.5" x 10.5" mat will hold a 5.5" x 8.5" insert. 3 size options: 7.5" x 10.5" • 10.5" x 13" • 13" x 19"
Stock: 7.5" x 10.5" • 10.5" x 13" • 13" x 19"
Custom: 10"x15" • 11"x17" • 12"x17¾" • 12"x18"
13"x19" • 14"x19" • 16"x20" • 17"x26"
Windows may be configured to insert from any side. Multiple windows and custom window sizes/shapes are available. 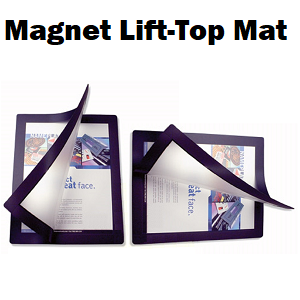 Stock Magnet Lift-Top Countermats have magnetic strips on three sides and are sealed on the fourth side. Magnetic strips on the base and surface hold the window closed. Want to display eye-catching promotional ads to your customers? Our Clear-Top Magnet Window Counter Mats make an effective and attractive countertop display. We can custom print your company's logo and promotional message on the counter mat surface.